On Saturday 26 October, some lucky visitors to the exhibition at the Grand Palais will also have an opportunity to take a guided private visit to Le Cyclop, the mammoth sculpture located in Milly-la-Forêt, south of Paris. The visit will be led by Bloum Cardenas, grand-daughter of Niki de Saint Phalle and trustee of the Niki Charitable Art Foundation; François Taillade, the director of Le Cyclop; and Jean-Gabriel Mitterrand. 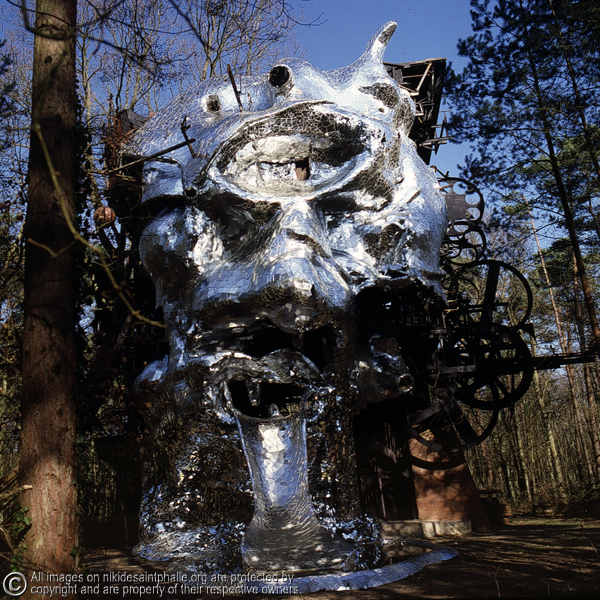 At 22.5 meters high and containing 350 tons of steel, Le Cyclop is a unique monument in the history of contemporary art, one that brings together four artistic movements: Dada, Nouveau Réalisme, art cinétique (kinetic art) and art brut (outsider art). The private tour will leave from the Grand Palais on Saturday 26 October at 9am and return at around 1pm that afternoon. To join the tour, visitors must present an “invité d’honneur” (VIP) badge. RSVP required at fiac.com/vip.html. Also in conjunction with the exhibition, the films Daddy and Where Is the Monster will be shown in the auditorium of the Grand Palais on Thursday 24 October from 5:00pm to 6:30pm. We live in arid times. Snug in our cubicles, we are cut off from nature. Safe in our suburban redoubts, we are separated from animals. Most striking of all, given thousands of years of human history, we live without myths. The stories and images of gods and goddesses that nourished our ancestors, helping them understand themselves and the world, are gone. We’re left with pale substitutes: celebrities. J Lo is a poor stand-in for Athena. Niki de Saint Phalle understood all this. And the French-American artist, who died in 2002 at age 71, determined to do something about it. She made paintings, prints and sculptures full of images and forms to reconnect us to what we’ve lost. 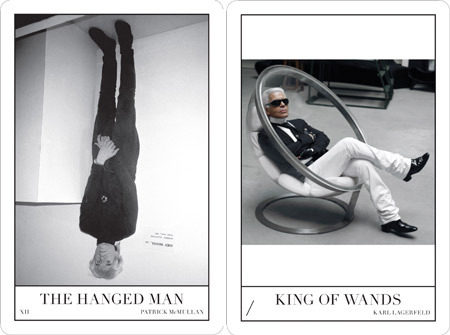 At the same time, she sought to inject a quality not often found in contemporary art  fun. 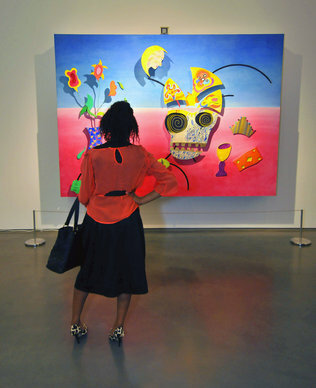 See how well she succeeded in “Niki de Saint Phalle: Creation of a New Mythology” at the Bechtler Museum of Modern Art uptown. Surely you’ve seen her five large sculptures on The Green across from the museum. Don’t stop there. The 54 works from the Niki Charitable Art Foundation inside the Bechtler brim with emotions, ideas and colors to ravish the optic nerve. Saint Phalle was self-taught. Working and living with artists in the mid-20th century, she sponged up influences from movements such as Cubism and especially Surrealism with its love of the unconscious and use of a distorted reality to express the inner self, dreams in particular. Employing the strategies of the naïve artist, her work is about emotional directness, not achieving a polished finish. Rather than seduce, she compels. She was unafraid of trying something new. She was also part of her time, and could not avoid, for instance, telling about the changing role of women. “The Bride,” a larger-than-life sculpture, is a looming figure, benign and scary, covered with found objects such as toy babies, guns, dolls and airplanes. Both a figure to worship and a cultural critique, it’s the wildest “Bridezilla” you’ll ever see. Saint Phalle loved symbols such as the rising sun on her “Firebird,” the much-photographed sculpture outside the Bechtler. The sun and firebirds appear in several other works as do hearts, skulls, stars and flowers. She especially loved snakes. They appear over and over, mostly, I think, as symbols of wisdom. That, after all, is what the serpent in the Garden of Eden offered Eve. Refashioned mythical figures from Egypt (Horus), early America, Mexico and India (Ganesh) appear. She also invented her own. Feeling a lack of positive African-American heroes, she created sculptures of several. 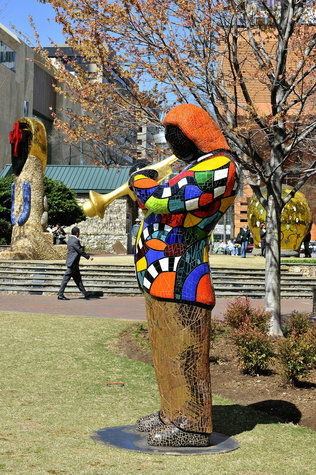 On the Green stands a Miles Davis, the jazz great wearing a coat of many colors and blowing a golden trumpet. Saint Phalle believed in color to chase the blues away. And in fun. A sculpture outdoors on the museum’s second level depicts a man and wife taking their pet tarantula for a walk. What a hoot! All these works show a marked use of pattern. Saint Phalle covered her pieces, whether in two or three dimensions, with fragments: bits of gold leaf, mirrors, glitter, colored glass, ceramic tiles and polished stones. As a technique, it breaks up surfaces and gives them visual energy. But it does something more. All that variety in material, texture and color subsume into a satisfying whole, a representation of the interconnectedness of life. Walking in The Green past “La Cabeza” (“The Skull”), I heard screeching children inside the huge sculpture. They could have been checking out the echo. Or feeling the shivering fear of being inside such a fantastic object. Most likely their sounds were the sounds of pure delight. They are at the precubicle stage of life and know how to have fun. They gave, I think, what Saint Phalle’s art demands from all of us: a response from the heart. 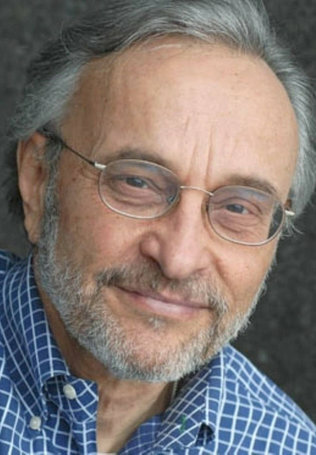 Richard Maschal is a retired Observer visual art and architecture writer. Photo 1  On the Green is Niki de Saint Phalle’s sculpture of Miles Davis. Photo by T. Ortega Gaines. Photo 2  “I Woke Up Last Night” (1994) is one of 54 works on display by Niki de Saint Phalle that brims with colors, ideas and emotions. Photo by T. Ortega Gaines. 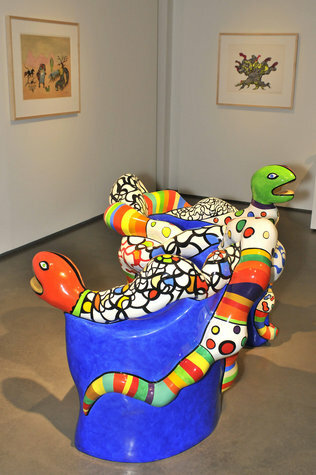 Photo 3  “Le Banc (The Bench)” (1991) by Niki de Saint Phalle is on view at The Bechtler Museum of Modern Art through October 3. Photo by T. Ortega Gaines. Photo 4  Author Richard Maschal. Photo by Wendy Yang. The five large sculptures on public display outside the museum and the 54 works inside the Bechtler “brim with emotions, ideas and colors to ravish the optic nerve,” says Maschal. You have the whole summer to see for yourself: “Niki de Saint Phalle: Creation of a New Mythology” will be at the Bechtler through October 3.